Dry to moderate moisture. Prairies, savannas, pine barrens. Full sun. Sandy soil. 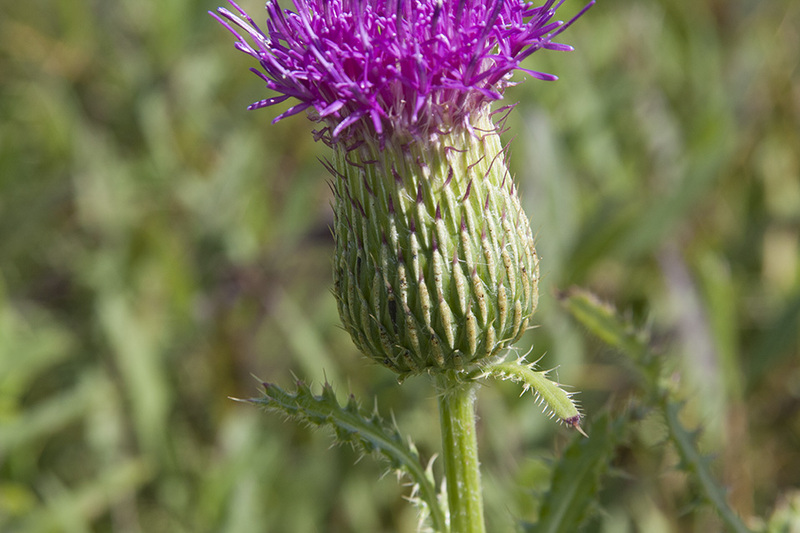 This is a short, stout thistle with a single, large flowering head. 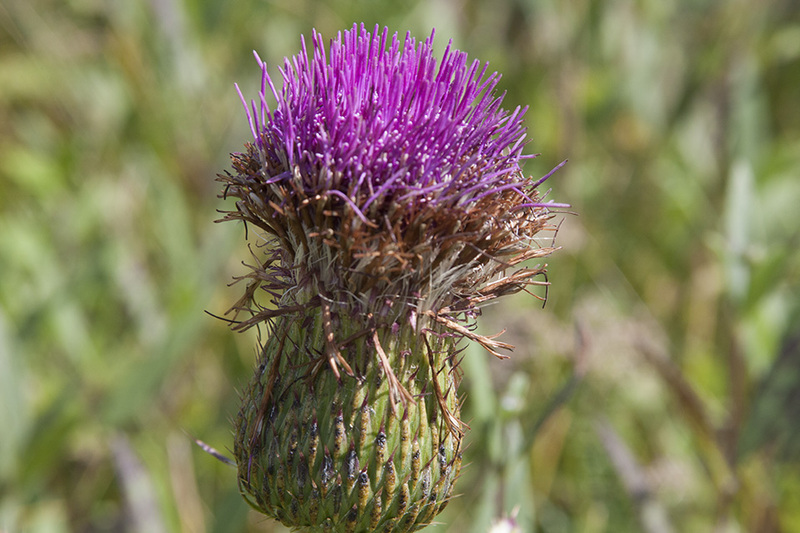 It is a 10″ to 24″ tall, erect, biennial or perennial forb that rises on a single stem from deep, thick, hollow taproot. The first year, and sometimes in one to three subsequent years, it appears as a rosette of basal leaves. In usually the third year it sends up a flowering stem and then dies. It is not colonial. The deep taproot allows it to survive adverse conditions. During times of drought, lack of light, or excessive heat or cold, above ground parts of the plant may die. When conditions improve, regrowth begins from buds on the taproot. The stem is erect, green, stout, soft, ridged, and usually unbranched, though sometimes there are 1 to 4 short, ascending branches toward the top. 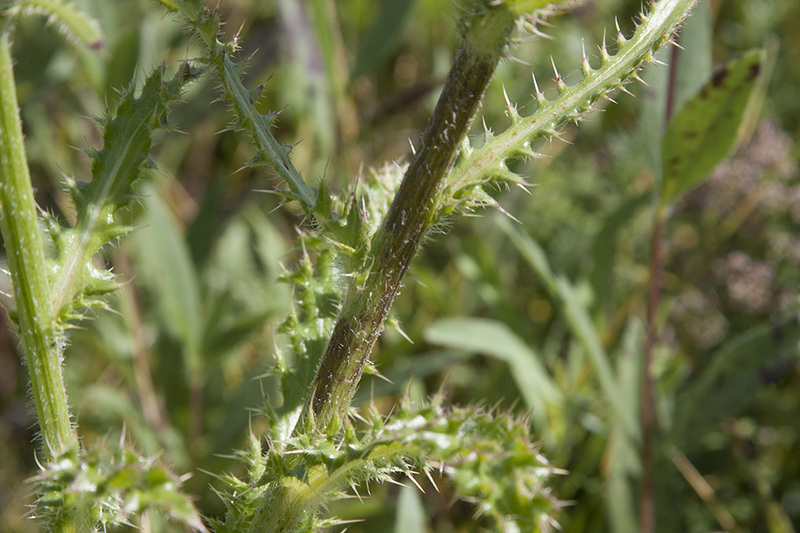 The stems are sparsely covered with long, soft, shaggy hairs. They are not winged and do not have spines. Basal leaves are narrowly oblong-elliptic, 4¾″ to 11¾″ long, and 13 ⁄16″ to 4″ wide. They are tapered at the base and usually shallowly lobed (pinnatifid). The lobes are egg-shaped to broadly triangular, and are usually separated by broad gaps (sinuses). The upper surface is green and is covered with two kinds of hairs. It is densely covered with long, soft, shaggy hairs, and thinly covered with long, tangled, cobwebby hairs. The lower surface green and is covered with long, soft, shaggy hairs, at least along the veins, but sometimes lacks the cobwebby hairs. The margins are more or less wavy. They have numerous short, fine spines and fewer, scattered, ⅛″ to ¼″ long main spines. Basal leaves are usually present at flowering time. Stem leaves are alternate and have irregular, triangular lobes. They are 2″ to 11¾″ long, and ¾″ to 4″ wide, but are otherwise similar to basal leaves. They become moderately smaller as they ascend the stem. They are not crowded, except sometimes near the base. The leaf bases do not continue down the stem, but often have ear-like appendages that clasp the stem. The inflorescence is a single, large flower head at the end of the stem and each branch. 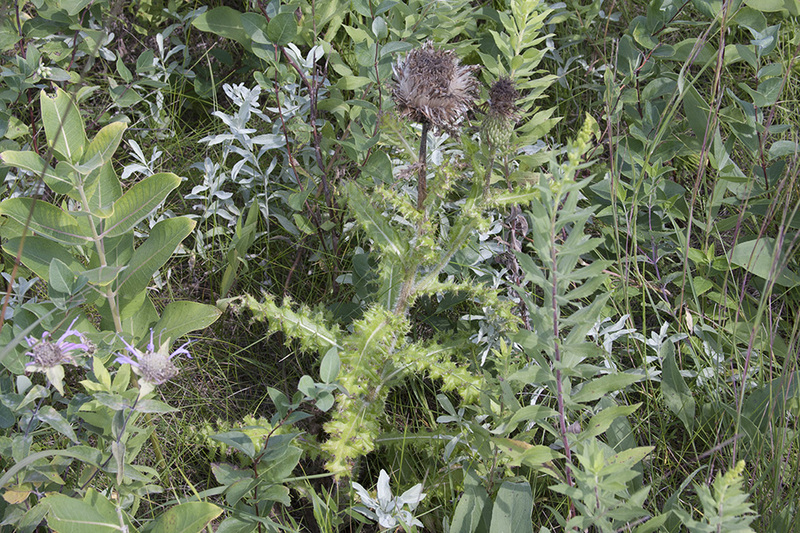 The flower head is stalkless or on a short stalk (peduncles). The peduncle is up to 6″ long and is not overtopped by upper stem leaves. There are usually leaf-like bracts on the peduncle, including 1 or more closely subtending the flower head. 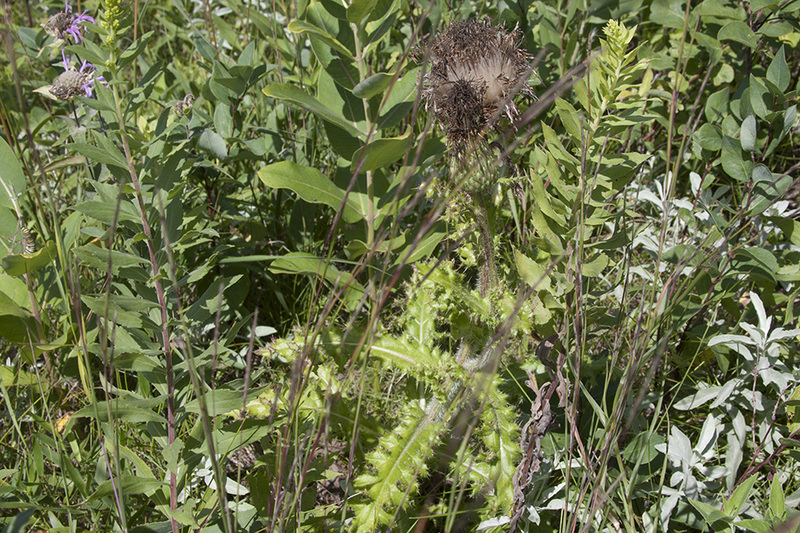 The whorl of bracts at the base of the flower head (involucre) is broadly cylinder-shaped to egg-shaped, 1⅜″ to 2″ long, and 1″ to 13 ⁄16″ wide. It usually has a few cobwebby hairs. 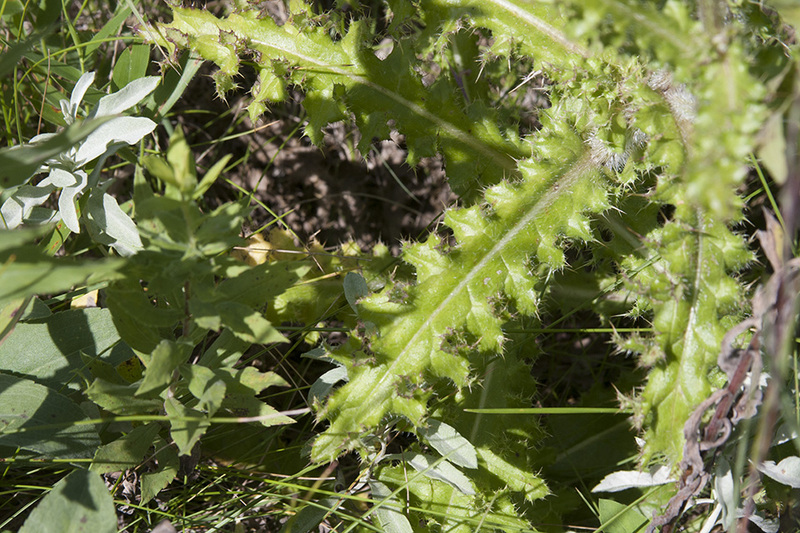 The bracts of the involucre are in 8 to 10 overlapping series. Each bract is egg-shaped to narrowly lance-shaped and has a prominent, raised, sticky ridge on the upper surface. 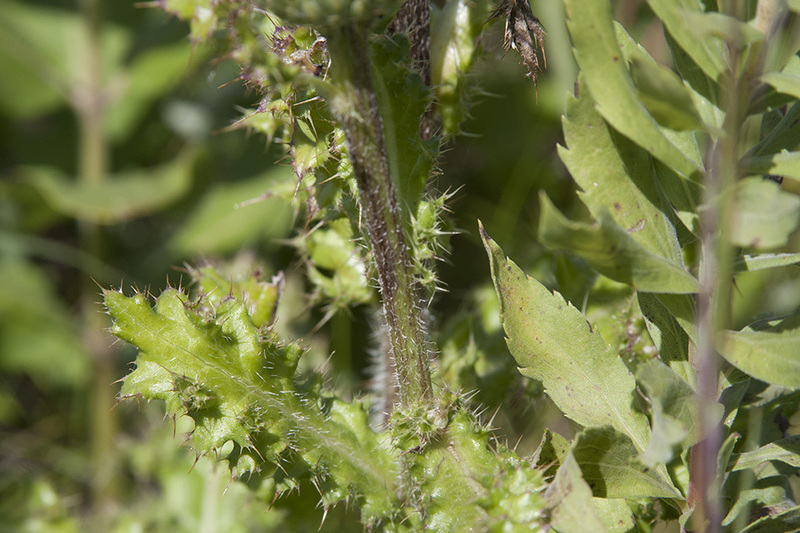 The outer and middle bracts are tightly appressed with ascending to spreading tips. At the tip of each outer and middle bract is a slender, 1 ⁄16″ to ¼″ long spine. The inner bracts are spineless. 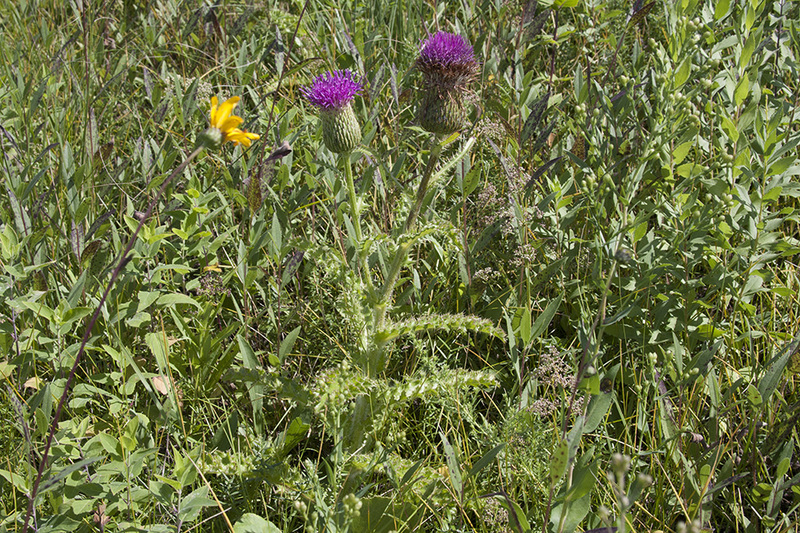 The flower heads are 1½″ to 2″ wide. There are numerous pale, pinkish to purple, rarely white, tubular flowers. The flowers are sweetly scented. The fruit is a dry, straw-colored to brown, ⅛″ to 3 ⁄16″ long cypsela with hairs attached. 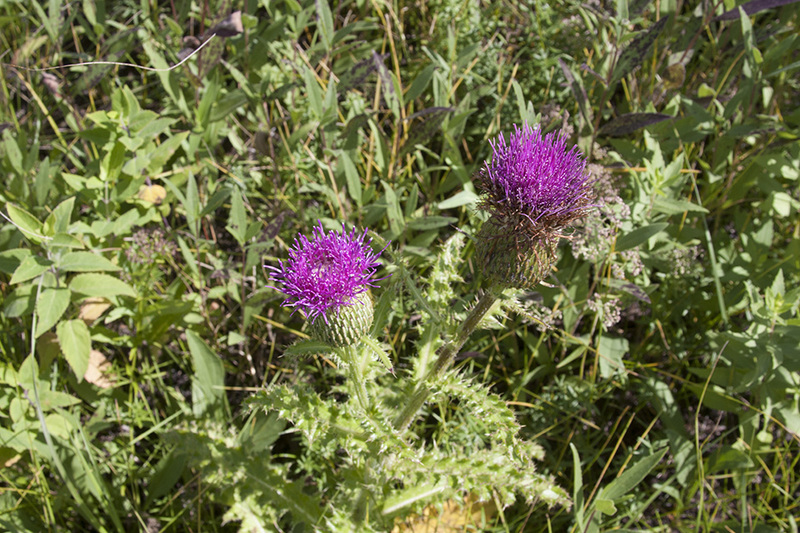 The short, stout stem with a single, large flower head make this one of the easier thistles to identify. Distribution Sources: 2, 3, 5, 7. A dry, one-chambered, single-seeded fruit, formed from a single carpel, with the seed attached to the membranous outer layer (wall) only by the seed stalk; the wall, formed from the wall of the inferior ovary and also from other tissues derived from the receptacle or hypanthium, does not split open at maturity, but relies on decay or predation to release the contents. The stalk of a single flower or flower cluster. Deeply cut, more than half way to the midrib but not to the midrib, into lobes that are spaced out along the midrib; the lobes do not form separate leaflets.